The federal agency that investigates refinery catastrophes released its final report late last month on the massive fire, volatile vapor release and toxic smoke plume at Chevron’s Richmond, Calif., refinery in 2012 that imperiled 19 workers and sickened 15,000 residents of surrounding communities. The report says Chevron knew the pipe that ruptured was made of material likely to corrode, that pipes of the same material at Chevron plants had previously failed and caused fires, that Chevron repeatedly rebuffed experts’ recommendations to replace the pipe, and that when the pipe did begin to breach, Chevron disastrously attempted to patch it instead of shutting down the high-pressure, high-temperature hydrocarbon process unit to which it was attached. 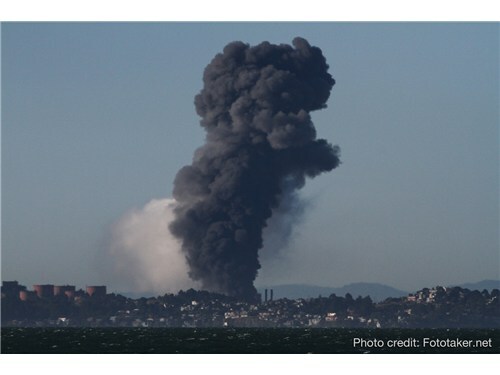 Smoke rises from Chevron refinery in Richmond, Calif., during 2012 fire. The Aug. 6, 2012 fire at Chevron was the latest in a long list of failures that spewed toxins into the community. In a lawsuit against Chevron for the 2012 smoke deluge,Richmond cited 14 incidents over the past 25 years. That’s very nearly one every other year. They include major explosions and fires in the plant and smoke overwhelming the community in 1999 and 1989. In those two, a total of 11 workers were injured, three critically. After that, Chevron inspected the Richmond facility for similar weakness and expertsrecommended the refinery replace the pipe that ruptured in 2012. Chevron didn’t do it. The CSB found that specialists advised replacement four more times. Chevron never did it. That’s not a good neighbor. After the fire, Richmond residents, environmentalists and USW members began working together in a coalition called the Refinery Action Collaborative to protect the safety and health of refinery workers and citizens living near the Richmond refinery and five others located within a 25 mile radius in the San Francisco Bay area. He said after the fire, black particles and soot settled on everything – cars, homes, vegetables in gardens. “It was clear that people were breathing a lot of this stuff,” he said. And they didn’t know what was in it.